Three Chinese astronauts undocked their spacecraft from an orbiting robotic module Wednesday (June 27) and began preparing to return to Earth Thursday night. China's Shenzhou 9 vehicle separated from the unmanned Tiangong 1 space lab Wednesday evening, according to China's state-run Xinhua news agency. The mission's three taikonauts, as Chinese astronauts are known, returned to Shenzhou 9 to begin the maneuver at 6 p.m. EDT (2200 GMT; 6:00 a.m. Thursday Beijing time). 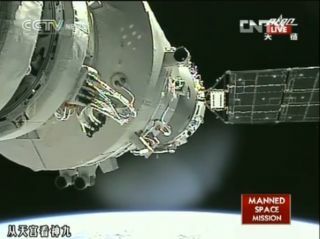 The spaceflyers are expected to land around 10 p.m. EDT Thursday (June 28; 10 a.m. Friday Beijing time), Xinhua reported. Their touchdown, in northern China's Inner Mongolia autonomous region, will wrap up a historic mission that has marked a big step forward in China's ambitious space plans. Shenzhou 9 launched on June 16 carrying three taikonauts, including 33-year-old Liu Yang, the nation's first woman in space. The mission aimed to pull off China's first-ever manned space docking, and it succeeded — twice. The vessel hooked up with Tiangong 1 via remote control on June 18 and then again June 24 with the taikonauts at the wheel. China thus became just the third country to performed a manned docking in orbit. The United States and Russia first accomplished the feat in 1966 and 1969, respectively. Shenzhou 9's flight is testing technology and techniques needed to build a permanently staffed space station in Earth orbit. Chinense officials have said the nation hopes to have a 60-ton station up and running by 2020. For comparison, the $100 billion International Space Station weighs about 430 tons. The huge orbiting lab is run by a consortium of more than a dozen countries, but China is not among them. China's space dreams don't end in low-Earth orbit. The nation has said it wants to return lunar samples to Earth with a robotic spacecraft by 2016 or so, and it plans to put a taikonaut on the moon sometime after the space station is built. Shenzhou 9's other taikonaut is Liu Wang, 42, who steered Shenzhou 9 away from Tiangong 1 Wednesday evening. Jing, 46, also flew on China's last manned spaceflight, the Shenzhou 7 mission in 2008. Shenzhou 9 is China's fourth manned space mission, with the other three flights coming in 2003, 2005 and 2008. The nation plans to launch another crew to Tiangong 1 soon, perhaps by the end of the year. Tiangong 1 has been circling Earth since September 2011, and in November it linked up with the robotic Shenzhou 8 vessel, achieving China's first unmanned space docking.